Hear “vanilla” and what’s the first thing that comes to mind? While we were researching vanilla for our annual Orchid Show, we kept discovering new scoops on vanilla ice cream. First we learned that one-third of all the ice cream that Americans eat is vanilla. All those moments dovetailed nicely when our own orchid expert, Pati Vitt, Ph.D., got inspired to make her own homemade vanilla ice cream. Naturally, as a scientist, she set herself a bigger challenge: to tackle Jefferson’s thorough (albeit old-fashioned) recipe, using three different types of vanilla beans kindly provided by Nielsen-Massey. We had to document Dr. Vitt’s ice cream-making adventure: see how she interpreted Jefferson’s recipe—and what three guest chefs/tasters had to say about the flavor—in our video (view on YouTube). put it on the fire again stirring it thoroughly with a spoon to prevent it’s [sic] sticking to the casserole. put salt on the coverlid of the Sabottiere & cover the whole with ice. open it to loosen with a spatula the ice from the inner sides of the Sabottiere. *Footnote from the Library of Congress: A “sabottiere” is an ice cream mold (“sorbetière” in modern French). You can use the recipe without modification, just cooling the mixture in an ice bath and then in the refrigerator overnight. One tablespoon of vanilla extract may substitute for the vanilla bean. The recipe makes about 4 pints (2 quarts, or one ½ gallon). Ice cream wasn’t the only vanilla treat on Vitt’s mind: she also canned a batch of vanilla spice apple butter (we shared it in a meeting—delicious!) and made her own vanilla sugar. Vitt agreed to share her recipe—and presented it all so charmingly, with handcrafted labels, trims, and tags, that we had to include a photo, too. 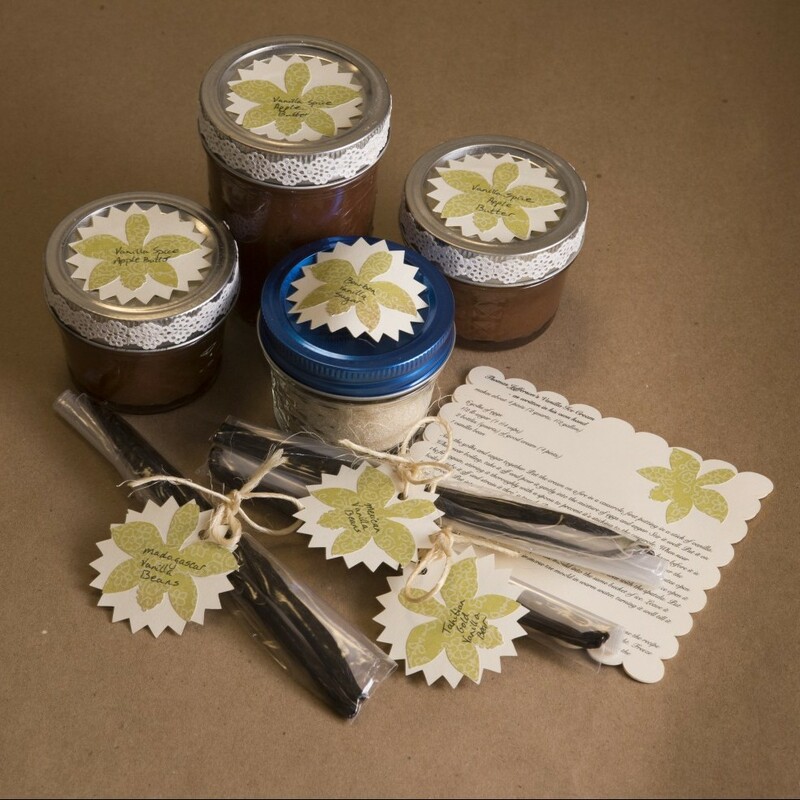 Vitt not only agreed to share her recipe for vanilla apple butter with us—but presented it all so charmingly, with handcrafted labels, trims, and tags. Wash, core, and slice 8 to 12 apples (Granny Smiths, or a mix of varieties) to fill a 6-quart crockpot to about 1½ inches from the top; add ½ cup of apple cider. Cook until completely soft—about the consistency of apple sauce. After the apple butter begins to thicken, add ½ cup sugar and the juice of one lemon. Cook an additional 30 minutes. Stir in cinnamon to taste, plus a pinch each of ground cardamom and cloves. Pour into hot, sterilized jars and place in a canning bath according to your canner’s recommendations for applesauce—usually about 10 minutes. For more ideas—sweet and savory—for cooking with vanilla, check out our February issue of the Smart Gardener. They share seeds. They share plants. They share tips. They share the knowledge accumulated during a lifetime of gardening. And of course they share the harvest. This fall I had the opportunity to share in a celebration of the harvest. I traveled to Monticello, Thomas Jefferson’s great Virginia estate (in the fine company of Chicago Botanic Garden horticulturists Lisa Hilgenberg and Nancy Clifton) for the annual Heritage Harvest Festival there. It was my first visit to the garden on the mountaintop, and in a whirlwind weekend of seminars, tours, and tastings, it changed the way that I think about growing food. The vegetable garden at Monticello has a simple layout and a world-class view. Architecture, history, and nature come together in a powerful narrative at Monticello, and the Harvest Festival brought the story of the place to life. But it was in the vegetable garden—carved into the side of the hill, with a simple layout and a world-class view—that I learned some important things about how Thomas Jefferson gardened. #1: He shared seeds and plants. In our still-young country, folks foraged for food—there weren’t a lot of native crops being grown. So Jefferson swapped seedlings with other farmers and gardeners. He asked embassies from around the world to send him seeds. He grew out plants and tested them to see what would grow on the mountain at Monticello. And he shared what he learned by keeping amazing records—check out his Garden Book at the Massachusetts Historical Society website. Jefferson was our first “foodie,” who grew his own produce for the food that he wanted to eat and serve. He experimented with crops that sound unusual even today: he tried raising sesame for its oil (he liked the taste) and he grew artichokes, still rare in American gardens. He decided to grow hot-weather vegetables (tomatoes, sweet potatoes, peppers) at a time when cold-weather gardening (cabbages, onions, greens) prevailed. His experiments proved that it could be done…the practice caught on…and today we consider tomatoes a basic garden crop. #3: He wasn’t afraid to fail. One of Jefferson’s great desires was to grow grapes for wine. Although he later came to be called the “Father of American wines,” Jefferson failed many times with grapes. But he kept at it, took notes, tried again. And eventually he succeeded with 23 different grape varieties. Same with fruit trees. Jefferson tried peach, apricot, pear, cherry, plum, nectarine, quince, and 18 varieties of apple trees at Monticello. Plus figs, which, it turned out, grow fabulously along a protected site in the orchard. (Best Monticello moment: the orchardist telling us all to pick a fresh fig and eat it on the spot.) Many trees succumbed to the weather or to lack of water, but Jefferson persevered. The orchards bear fruit to this day. Grapes in the orchards at Monticello. Thank you, Lisa, for the photos. As this harvest season comes to a close, and as we gather ‘round the table to celebrate, I am profoundly grateful for all that my garden and gardening friends have shared with me. I’m thinking differently about next year: I want to experiment with new crops…try growing a couple of fruit trees…order some really unusual seeds…and fail spectacularly at a thing or two. And, of course, share the harvest.